Yeah, a lot of the music we loved as kids I can cheerfully classify as crap (Billy Ocean! Whitney Houston!). But I refuse to put Air Supply in that category, dammit. Some of the most beautiful love songs of our era came from them. Plus two of my best friends saw them at the Minnesota State Fair, and one of the guys (Russell Hitchcock or Graham Russell, it always cracked me up that they had similar names) fell off the stage and broke his leg or something. I can only imagine he stopped singing at the time. "All Out of Love" might just be my favorite. I'm all out of love, I'm so lost without you. But "Lost in Love" isn't half-bad either. Reach for a star, and I'll show you a plan. "Making Love Out of Nothing At All" is bombastically 1980s. I can make every tackle at the sound of the whistle, I can make all the stadiums rock. Other hits include "Every Woman in the World To Me," "Just When I Thought I Was Over You," "Even the Nights Are Better," "Two Less Lonely People in the World" and others. 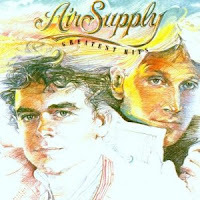 The Air Supply sound started to get repetitive after about a song and a half -- I never bought a whole album by them or went to a concert, stage fall or no. But for that song and a half, they were the sound of young love in the Eighties for a lot of us, and I still hear it in their songs. Flame if you must, but I'm still lost in love. If you grew up in the '80s, Air Supply was part of the soundtrack of your youth... simply because you couldn't get away from them! They were everywhere, whether you wanted them to be there or not, probably as much or more so than Michael Jackson. They were the ultimate MOR group, and all their songs sounded alike -- yet I can remember each and every one you cited. And now they're all stuck in my head!! !